William T. Trego | Catalogue Raisonné | Unfinished Oil Portrait of Well-dressed Older Man, n.d. Unfinished Oil Portrait of Well-dressed Older Man, n.d.
Trego did a number of portraits in his last years, and only a few of them have been documented. Several portraits or portrait sketches can be seen in his studio in photographs taken there. 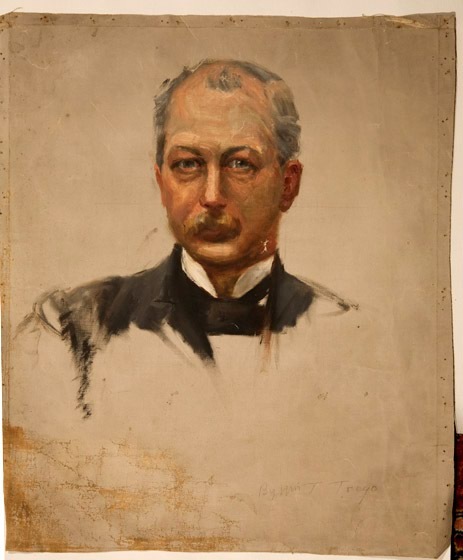 After the death of Jonathan Trego, whose specialty had been portraiture, in 1901, William received commissions that would have previously gone to his father. Obtained from the artist or his estate by Walter E. Baum and passed down in the Baum family. The current owner is a grandchild of Walter Baum. The portrait is in fair condition, needing a cleaning and replacement of the stretchers.